Martin Luther King Jr. speaking to black sanitation workers in Memphis. Martin Luther King Jr. used his pulpit at Ebenezer Baptist Church in Atlanta to comfort, teach and uplift his congregation. Sometimes his sermons did the same for himself. King's close aide and friend, Andrew Young, says, "Preaching was the way he affirmed his faith." This was especially true in the last year of King's life, April, 1967-April, 1968. More than ever before, King battled doubts, exhaustion and anxiety. King kept his inner struggles private; only those closest to him knew of his suffering. But several sermons he delivered in that last year offer a glimpse of King's personal turmoil, and how he tried to preach his way through it. The sermons also reveal the deep passion King felt for his mission as a Baptist minister and preacher of the social gospel. On April 4, 1967, King condemned the Vietnam War in a speech at New York's Riverside Church. He knew the address would destroy the tentative alliance he had enjoyed with President Lyndon Johnson. In the mid-1960s the two had worked in tandem to get crucial civil rights legislation passed. As the war in Vietnam intensified, King occasionally signaled his opposition, but he muted his comments to avoid offending Johnson. Historian David Garrow says King's criticism of the war increased as Johnson poured more men and money into Vietnam. "King's disappointment with Johnson's administration was so acute by 1967 that King believedï¿½that he had nothing to lose by becoming a clear, total, outspoken opponent of Johnson on the war," Garrow says. "King, by 1967, had made the decision with regard to Vietnam, economic inequality and anti-poverty efforts in the U.S. that he had to become an opposition leader and figure." 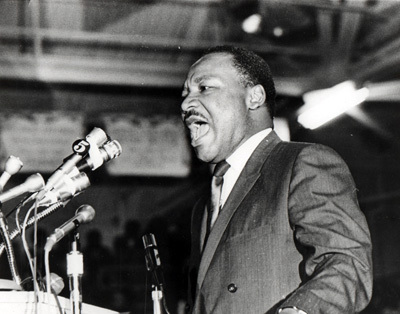 On November 5, 1967 King delivered a sermon to his congregation at Ebenezer Baptist Church explaining the connection between Biblical teachings and the practice of civil disobedience. King told the story of three men who refused to follow a ruler's law because it violated divine law. The men were sentenced to death, which they bravely accepted. King lauded their decision. "There comes a time when a moral man cannot obey a law which his conscience tells him is unjust," he said. Great moments have often come forth because there were those individuals, in every age and every generation, who were willing to say "I will be obedient to a higher law." These men were saying, "I must be disobedient to a king in order to be obedient to the King. Historian Clayborne Carson directs the King Papers Project at Stanford University. He says King's decision to take on the role of political outsider flowed directly from his calling as a Christian minister of what's called the social gospel. The term signifies a Christian focus on "economic concerns, the material concerns of poor people, and making the world a better place," Carson says. For King, the social gospel was "global," Carson says, "and it was about social justice." King was not becoming more radical in his last year of life, Carson says, he was returning to his roots. Carson says King's decision to disavow political expediency was freeing. One can hear in the sermons and speeches King delivered in late 1967 and early 1968, Carson says, "this strange combination of despair and exhilaration, that here is something worth giving your life for." At the end of the November 5th sermon, King told his congregation, "If you have never found something so dear and so precious to you that you will die for it, then you aren't fit to live." You may be 38 years old ... and one day, some great opportunity stands before you and calls upon you to stand up for some great principle, some great issue, some great cause, and you refuse to do it because are afraidï¿½ Well, you may go on and live until you are 90, but you are just as dead at 38 as you would be at 90. "I'm a sinner like all of God's children"
If King found exhilaration in the role of political outsider, he also experienced tremendous isolation. One can glimpse King's distress in a few of his last sermons, particularly one he delivered just a month before he was assassinated. King titled the sermon, "Unfulfilled Dreams," and began by describing the story in the Old Testament about King David and his efforts to build a great temple. King said David was never able to finish his temple, but the Lord blessed him just for trying. "It is well," the Lord said, "that it is within thine heart." And so often we don't finish them. Because life is like Schubert's "Unfinished Symphony." At so many points we start, we try, we set out to build our various temples. And I guess one of the great agonies of life is that we are constantly trying to finish that which is unfinishable. We are commanded to do that. And so we, like David, find ourselves in so many instances having to face the fact that our dreams are not fulfilled. King concluded with the stark declaration, "Life is a continual story of shattered dreams." One reason, King said, is the struggle between good and evil, which exists not just in the world but within our hearts. "There is a civil war going on in your life," King declared. "And every time you set out to be good, there's something pulling on you, telling you to be evil." King did not disclose the precise nature of his own moral failings but made it clear he had them. Among his weaknesses were a series of extra-marital affairs he continued until the end of his life. King told his congregation, "You don't need to go out this morning saying that Martin Luther King is a saint. I want you to know this morning that I'm a sinner like all of God's children!" Despite his failings, King testified, "I want to be a good man." King's sermon revealed his struggle with failure, both in his personal life and in his mission to help the disadvantaged. As several historians have written, King always battled the sense that he was not worthy of the accolades and awards he had won. But the sermon also showed a kind of deep determination. According to Clayborne Carson, King was saying, "This is what I was put on earth to do. I feel totally committed to doing it. And I might fail." King knew he might fail because one task he'd set for himself - getting rid of poverty - was, to use his word, "unfinishable." But even if his goals had been attainable, King knew he might not live to see them through. King was acutely aware that as the nation's leading civil rights activist he might be killed one day. He'd been the target of many death threats and bomb scares. As the possibility of death seemed to edge closer, King spoke of it more with his close friends and family. He also spoke of it in church. "Tell them I was a drum major for justice"
On February 5, 1968, King explained how he would like to be remembered when he died. He was speaking to his congregation at Ebenezer, a church founded by King's maternal grandfather, and that was led for years by King's father, the Rev. Martin Luther King Sr., or "Daddy King." Ebenezer was home. Martin Luther King Jr. grew up there. His mother played the church organ. When King preached that morning in February, he was preaching to family and friends. Many worked with him at the Southern Christian Leadership Conference. King opened his sermon by reflecting on the "drum major instinct," the desire all people share, "to be out front, ... to lead the parade, ... to be first." If you want to say that I was a drum major, say that I was a drum major for justice. Say that I was a drum major for peace. I was a drum major for righteousness. King was preaching his own eulogy. A tape recording of that eulogy was played at King's funeral two months later. Back to King's Last March.